Pakistan’s north-western border areas are fast becoming an international flashpoint. On Wednesday, eight more Nato oil tankers were torched and a driver shot dead on the outskirts of Quetta—the sixth such attack since the country last week closed to international troops a major border crossing with Afghanistan, apparently in response to Nato helicopter strikes in its territory. One such strike killed three Pakistani soldiers. 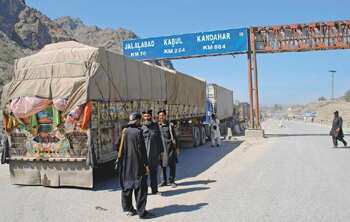 Though the US continues efforts to convince Pakistan of the need to ease restrictions on cross-border supply convoys, tensions between Washington and Islamabad are rising with each passing day. In an effort to defuse the situation, Nato secretary general Anders Fogh Rasmussen apologized for the three deaths last week, and said that he hoped Pakistan would reopen the border quickly. The US has also stepped up drone strikes in Pakistani tribal areas, after reports surfaced that militants linked to Al Qaeda there might be planning terror attacks on Europe and the US. Escalating tensions on the Pakistan-Afghanistan border have underscored mounting alarm about Pakistan in the White House, driven also by the country’s unhealthy political climate. The Pakistani military leadership is more and more sceptical about the civilian government. It has also rebuffed US plans to move against key militant strongholds in North Waziristan. This has been a growing source of frustration for US officials, who face a deadline this year to show progress in the Afghan war. Extremists are exploiting the post-flood chaos in Pakistan to their advantage, even as the disaster has forced the diversion of resources and focus away from the nation’s struggle against Islamic militants. Drone attacks are making the US even more unpopular, with public anger rising among ordinary Pakistanis over the civilian deaths that often accompany such strikes. The fate of Pakistan and its nuclear arsenal was central to Obama’s thinking when he deployed 30,000 more troops in Afghanistan last summer. Incidentally, that number was a compromise—General Stanley McChrystal, then commander of US forces in Afghanistan, wanted 40,000 reinforcements to pursue a classic counter-insurgency strategy; sceptics led by vice-president Joe Biden, on the other hand, proposed a smaller troop figure of 20,000 focused on a narrow mission of hunting down terrorists. As Bob Woodward has revealed in his latest book, Obama’s Wars, fears about Pakistan—a nuclear power with a fragile civilian government, a dominant military and an intelligence service that sponsored terrorist groups—have shaped the trajectory of Obama’s Af-Pak policy. The US intelligence set-up has consistently warned that not only do Al Qaeda and the Taliban continue to operate from safe havens within Pakistan, but that terrorist groups have also been recruiting Westerners to wreak havoc in Europe and North America. The US increasingly views Pakistan as a dishonest partner, unwilling or unable to stop elements of its intelligence service from giving clandestine aid, weapons and money to the Afghan Taliban. Obama himself made it clear to Woodward that “the cancer is in Pakistan". As tensions mount between the country and the US, there is a growing concern about Pakistan’s stability amid the rising tide of popular discontent with the civilian government. There are indications that Pakistan’s powerful army and opposition parties are positioning themselves to install a new civilian government to replace President Asif Ali Zardari and his prime minister in the coming months. For Obama, the reason for creating a secure, self-governing Afghanistan was to prevent the spread of the “cancer" from Pakistan. Pakistan’s main priority has been to take on its home-grown Tehrik-e-Taliban (TTP)—an offshoot of the larger Taliban organization. But the links between TTP and other terrorist organizations are much too evident to ignore. The US has also pressured Pakistan on Lashkar-e-Taiba (LeT). However, though the Pakistani government is holding Zakiur Rehman Lakhvi, commander of the Mumbai terror attacks in 2008, he “continues to direct LeT operations from his detention centre", and LeT is now even threatening attacks in the US. But the Pakistani military has other priorities. Its chief, General Ashfaq Parvez Kayani, has admitted to the US that his focus remains on India. In Woodward’s account, he told US national security adviser James Jones: “I’m India-centric." Around 50% of supplies for the troops in Afghanistan—including food, fuel and other staples— moves through Pakistan. By closing the supply route to Afghanistan, Pakistan has reminded the US of the leverage it enjoys over Western presence in Afghanistan. Despite present tensions, the US has few options but to rely on Islamabad for tackling the problems in Afghanistan. It is increasingly becoming clear that Washington will start its departure from Afghanistan next year, leaving Pakistan as the crucial arbiter of political change in Kabul. India will have to think outside the box if it is to preserve its vital national interests in its neighbourhood.